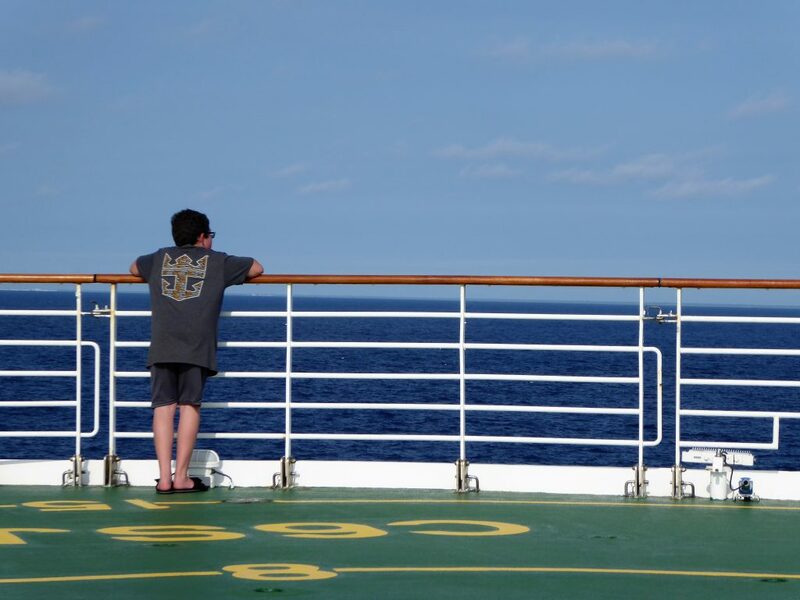 Cruising is our favorite way to travel. We have enjoyed landing in various ports of call, seeing the world, finding adventure on an island, and enjoying the amenities on board. 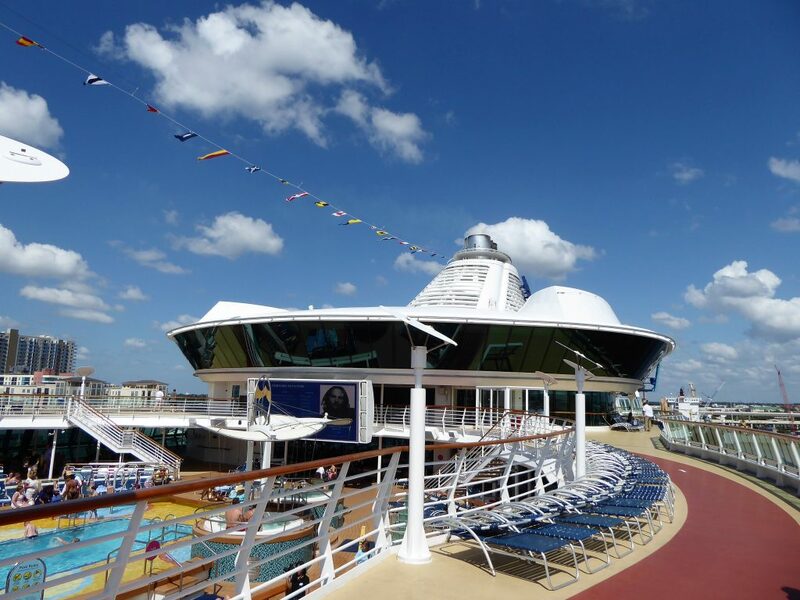 Recently, we cruised on Royal Caribbean’s Brilliance of the Seas. 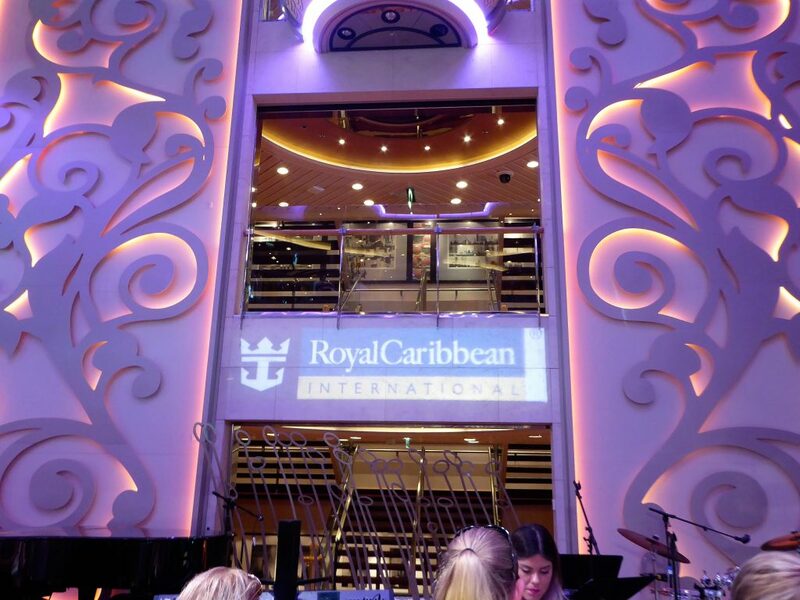 This was our first cruise on board a Royal Caribbean vessel. Brilliance of the Seas is one of the smaller ships in the Royal Caribbean fleet, but it still offered us a lot of on board adventures. 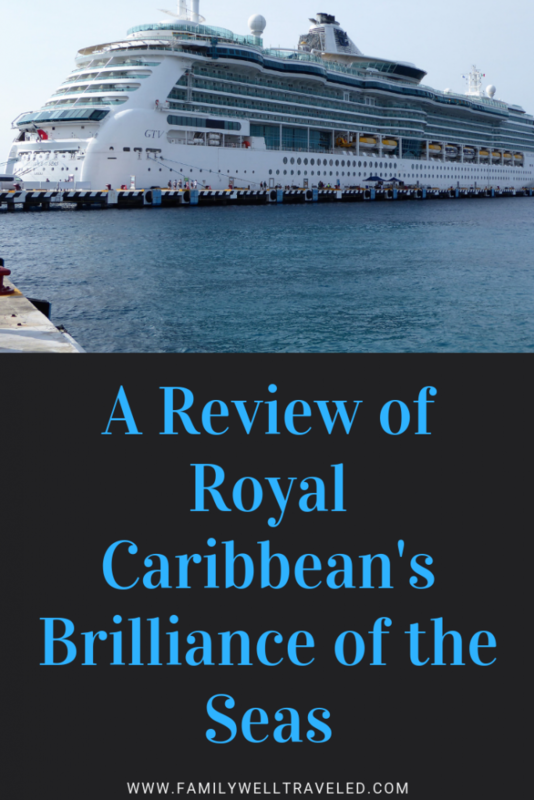 Here is all you need to know if you are cruising on Royal Caribbean’s Brilliance of the Seas. 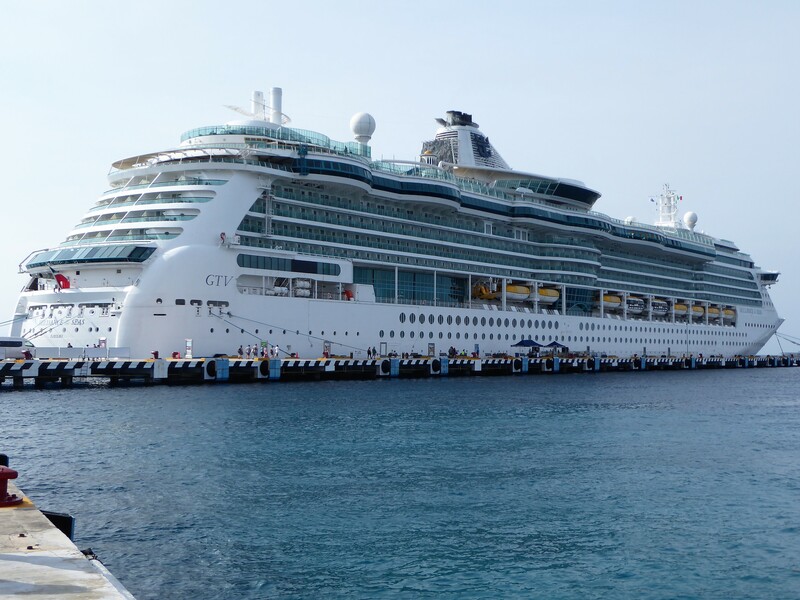 We have cruised several times before, so we were prepared for the experience of getting on board the Brilliance of the Seas. However, if you have never cruised before, it is critical that you know what to expect when you get to the port. First, when you get to the port, someone will collect your luggage which will eventually get delivered to your stateroom. You will not see your luggage for several hours, so make sure that any documents (passports, boarding pass, etc). and medications are in hand. Once we dropped off our luggage we proceeded to the terminal where we were had to present our boarding pass and forms of identification. Then we had to pass through metal detectors before joining a line to get our Sea Pass cards. The lines are usually long, but this line moved rapidly and we were soon checking in, getting our photo id taken and issued our Sea Pass. The Sea Pass is your on board lifeline. It is your cabin room key, your credit card while on the ship, and your id for getting on and off the vessel on port days. Following the check-in, we bypassed the line for photos. We always skip this line. After traveling to get to the ship, we are usually disheveled and don’t want that image captured forever on glossy. Our children received their wristbands with our muster station (the location you assemble if there is an emergency on board). Children 11 and younger receive a muster station wristband in case they are not with you in the event of an emergency. In this unfortunate circumstance, a crew member would get your children to your muster station to meet you. From here, we walked across the gang plank, checked in with our Sea Pass cards, and got on board the Brilliance of the Seas. 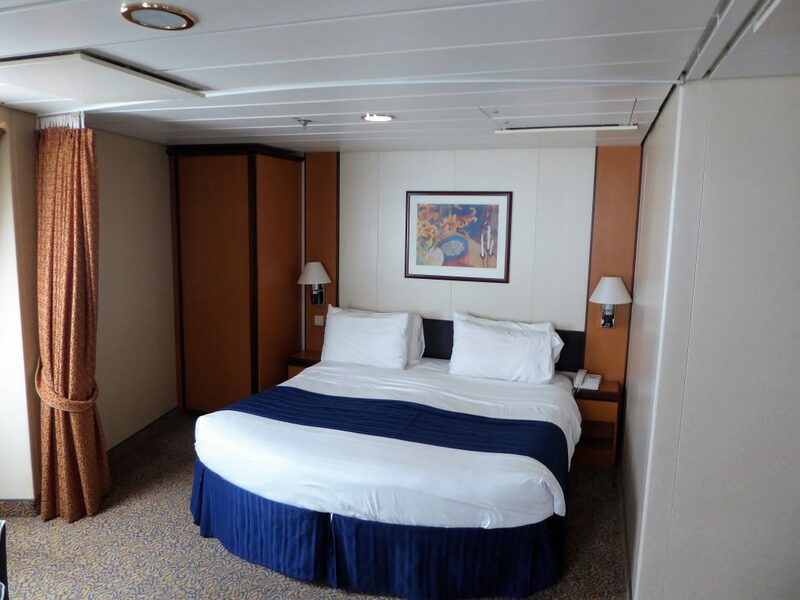 On Brilliance of the Seas our family chose an upgraded Ultra Spacious Ocean View stateroom cabin, which was roomier than the average cabin. Our room had an extra offset nook with a single bed and a pull down bunk bed where our kids slept. 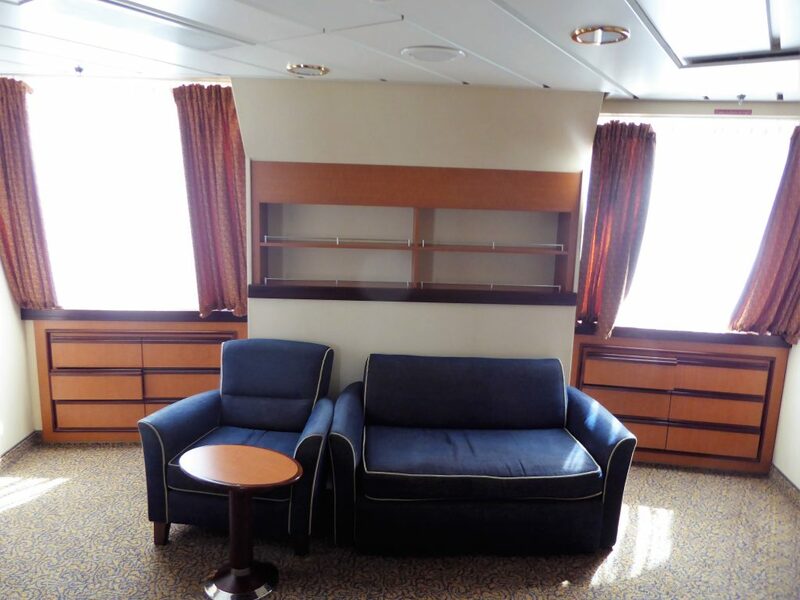 The living area was large for ship standards. It included two large port windows which look like bay windows where the kids could sit and watch the seas. Our bed was off from the living area, and had a curtain which we could pull for privacy. We enjoyed that the kids’ beds and our bed were separated by the living quarters, giving everyone a little extra privacy. The master bed included a privacy curtain. We also enjoyed the ample storage in our room. We had three closets and several cabinets and dressers for all of our clothing. Our stateroom was at the front of the ship, so we did experience some rocking especially when we rode through the edge of Hurricane Michael. Our daughter sits on the port window looking out at the sea. While our room was more spacious than other cabins, the bathroom was the same size as other cabin bathrooms. It’s small as is the shower. But, that’s one of the things we have come to expect from cruise ships. 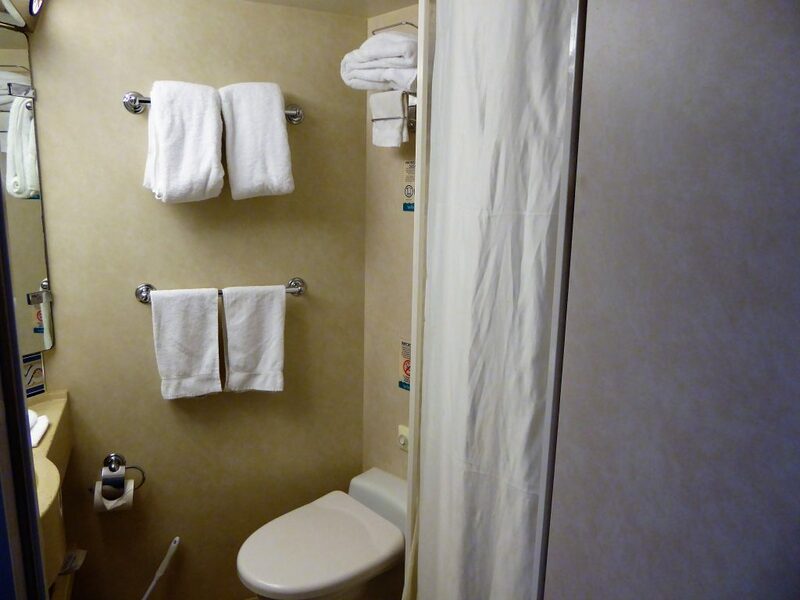 The standard bathroom in our stateroom. Our family ate all of our meals at either the Windjammer Buffet or the Minstrel Dining Room. 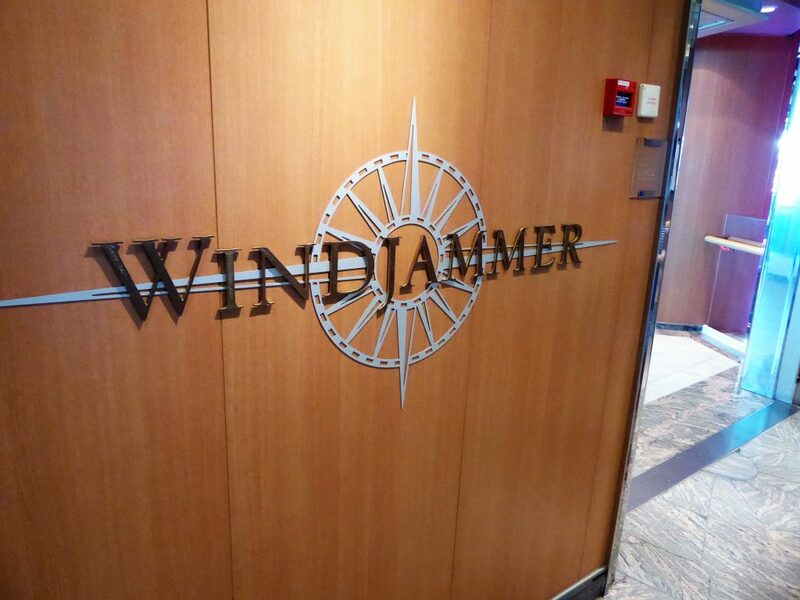 The Windjammer had standard cruise buffet fair. Breakfast included options with scrambled eggs, bacon, yogurts, fruits, cereals, omelettes, etc. Lunch included burgers, pastas, salads, and deli meats. Dinner options included salads, soups, meats, etc. Each meal had a specialty meal, whether Indian, Chinese, or Thai. The food was pretty standard and pedestrian. Nothing really exceptional here, but the ship provides those foods one would expect with flavors and tastes that are expected, too. We found service to be a little slow, with many tables vacated but not bussed for some time. Unfortunately, this often limited available seating in the sometimes cramped dining rooms. 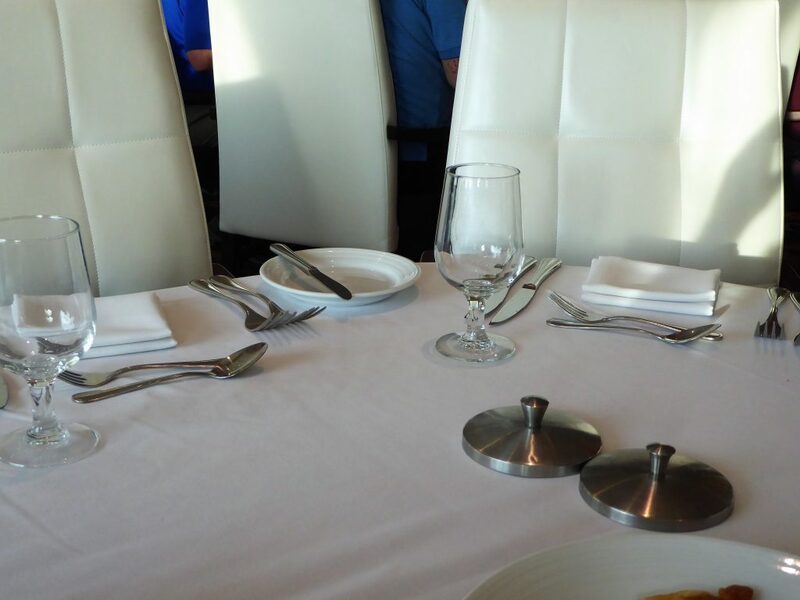 The primary dining room on board the Brilliance of the Seas is the Minstrel Dining Room. While there is a Dine on Your Time option, we chose to eat at a set time. You can choose from Early or Late Dining options. The Minstrel offers rotating sit-down menu options. Each dinner included vegetarian, chicken, beef, and pasta options. Dinner is a three course meal with appetizer, main course, and dessert. The food was good, but the service was lacking at our table. 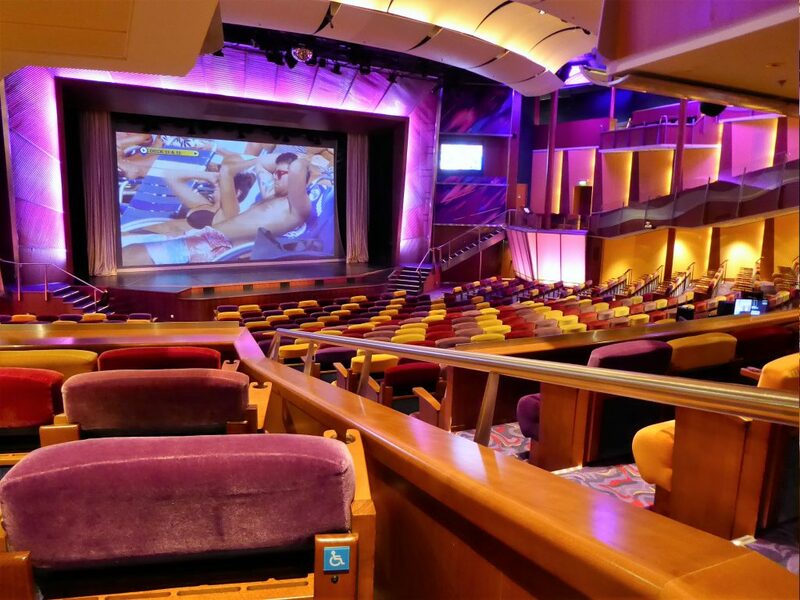 Brilliance of the Seas provided nightly entertainment in the Pacifica Theater showroom. Entertainment included a comedian, a juggler, and full production shows including singers, dancers, and live band. Our family really enjoyed the comedian and the juggler. Unfortunately, we engaged in some other onboard activities and were unable to see the full production shows. We were impressed with the showroom. There was ample seating in plush captain’s chairs. Other ships have had more bleacher or pew seating and it always seems like there is not enough room in the showroom. Not so on the Brilliance of the Seas. Also, the showroom seating had very very obstructed view seating, unlike other ships where many seats have obstructed views of the stage. 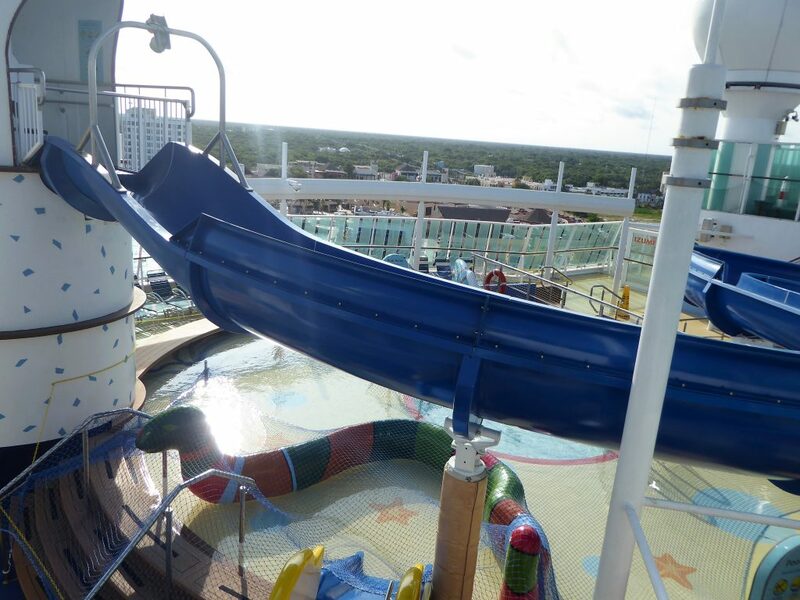 Brilliance of the Seas has three pools — a small shallow kids pool with water slide, the main pool, and an adults-only pool in the Solarium (an adults-only section of the ship). The main pool also has two whirlpools nearby. Each pool has lifeguards. The ship provides pool towels and life jackets if desired. The Adventure Beach kids’ pool and adult pool have limited hours of operation. The kids’ pool especially has limited hours, which was a little disappointing. Also, this pool area has the ships only water slide, which was a disappointment to our kids who enjoy the water slides on board. Insider Tip: Children must be potty trained in order to swim in the pools. Swim diapers are not allowed. The slide at the kids’ pool. The main pool, which is open most of the day, was often crowded. Our kids didn’t mind the crowded pool, but my wife and I refrained from swimming because of the crowds. The main pool area also has a stadium size screen showing pool-side activities and movies. The shops on board the Brilliance of the Seas had the standard cruise finds, including t-shirts, hats, watches and jewelry. 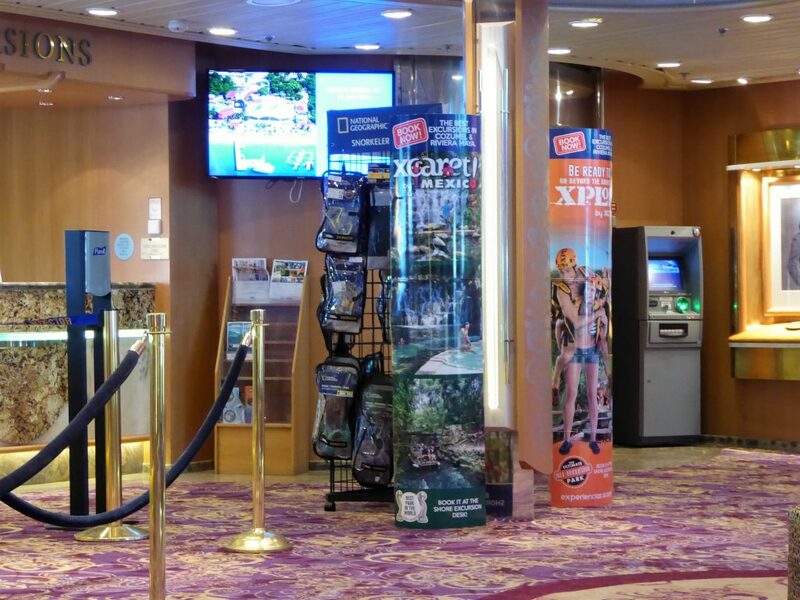 The shops run specials throughout the cruise, so you’ll want to keep your eyes pealed to the daily happenings. Our favorite specials were the $10 shirt events. Our kids left the ship with plenty of merchandise containing the Royal Caribbean logo. One of our favorite on board activities is the art auctions. 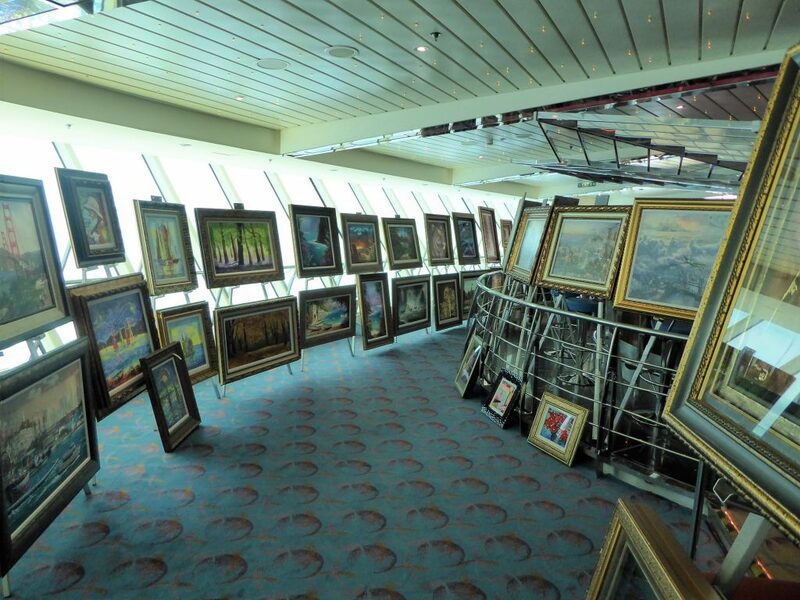 We have collected several art pieces from Park West Gallery, which has auctions on board more than 100 cruise vessels. This trip was no exception for us. We attended two art auctions, and some special art presentations. The auctions are fun, and the Park West auctioneers always do a great job of engaging the bidders with fun “mystery” bids and champagne. Artwork by world-renowned artists is auctioned on board. Unfortunately the art gallery left something to be desired. 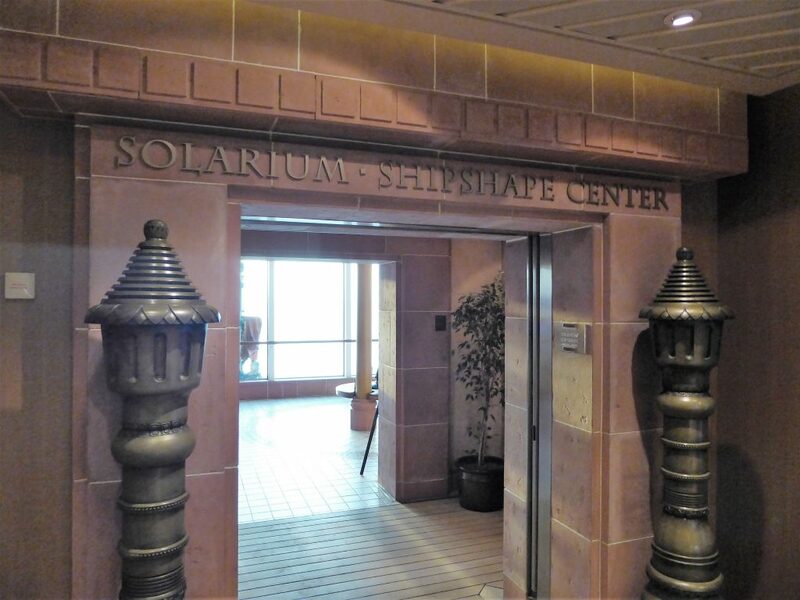 It is located on Deck 5, between the Pacifica Theater and the Photo Gallery in a narrow hallway. Unfortunately, while trying to unveil new artists in the gallery, the Park West Staff had to fight the sea of guests heading to or leaving the theater. Also, the staff have to close auction transactions in this same narrow passageway, which was inconvenient. These desks both offer resources and help for all guest cruisers. The Shore Excursions desk assists cruisers in booking on shore excursions during their port days. Royal Caribbean has a number of tour and excursions available at each destination. When you book a Royal Caribbean approved excursion you need not worry about shady tour operators or missing your ship at the end of the day. The Shore Excursions staff was very helpful assisting us in booking our excursions. They were able to provide information regarding how long we would be at each destination, if meals were provided with our excursions, and departure times. 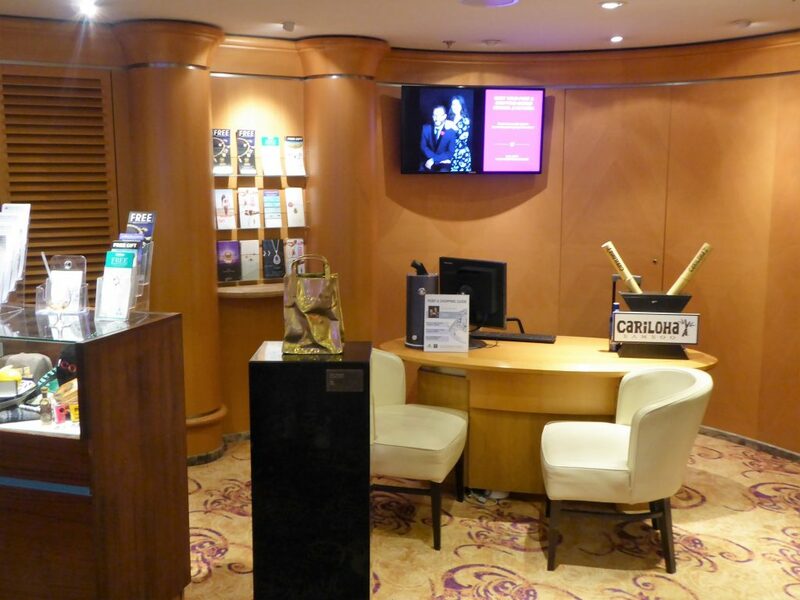 The Guests Services desk is the go-to resource for any questions or concerns regarding your bill or service on board the ship. You can always call the guest services phone line 24-hours a day. The Centrum is the central meeting spot for many events, including entertainment. During our trip, we saw yoga classes, classical music concerts, and vocalists performing at the Centrum. 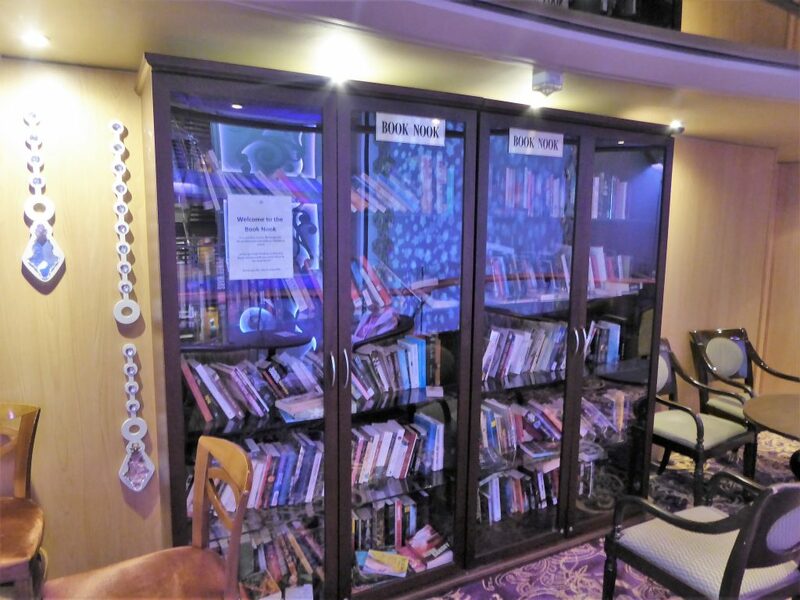 The ship has a book lending library on Deck 9. It is open 24-hours of the day, and includes a small seating area next to the bookcase. This is a lending library, and selections are limited, but we found enough books that you should be able to find something to entertain you during sea days. 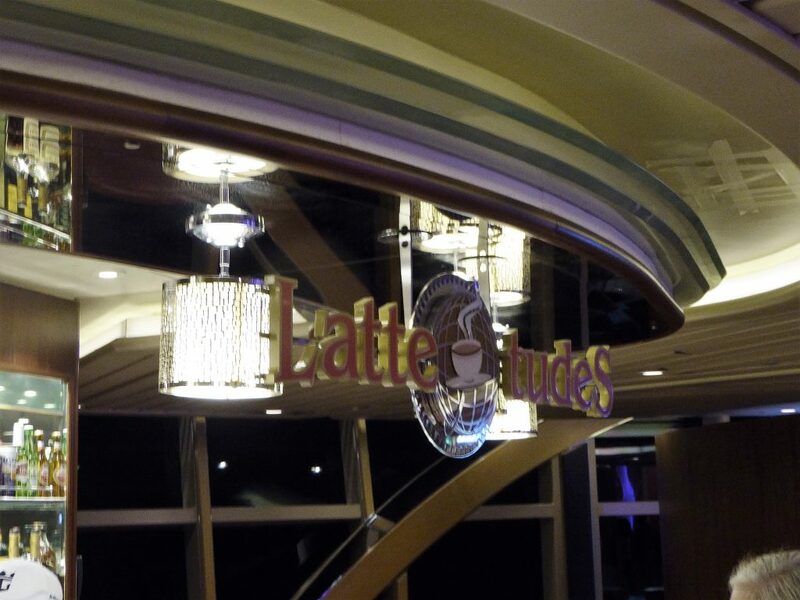 If you want specialty coffee during your stay on board the Brilliance of the Seas, Cafe Latte-Tudes is the place to be. Baristas offer a number of caffeinated hot and cold beverages, including some with liquor. The cafe also has pastries. There is a nice seating area at Latte-Tudes overlooking the sea. Since the cafe is one deck above the Centrum, you also can listen to the music coming and events from the Centrum. Ready to book your next cruise? While on board the Brilliance of the Seas, the Next Cruise staff can assist you with booking your next adventure. The Next Cruise staff offers some sensational deals for those ready to book a subsequent cruise while on board. 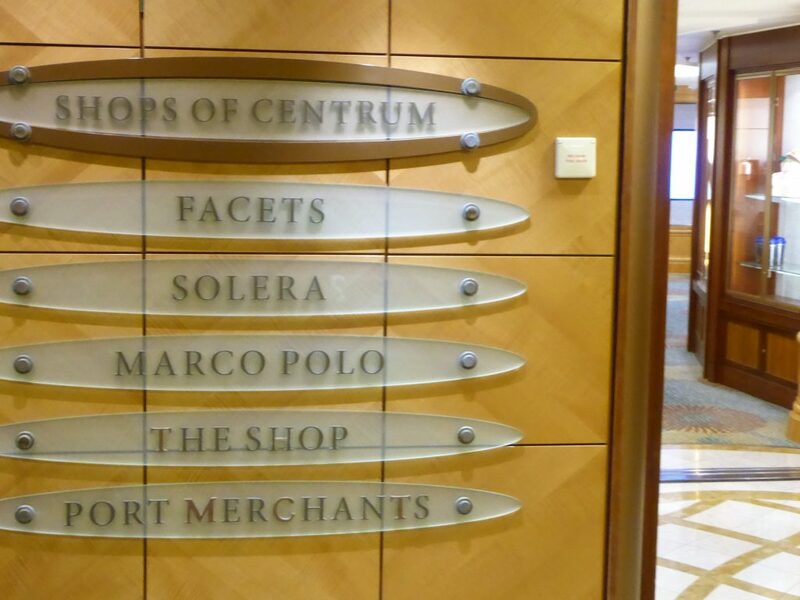 Yes, there is a shopping specialist on board the Brilliance of the Seas. The shopping specialist provides cruisers with recommended stores in each port. The specialist also provides maps of each port and brochures with free offers at select shops. If you know exactly what you are looking for, you owe it to yourself to visit the shopping specialist who can provide a personal referral card to a specific shop. This card should ensure you the best price on a item without having to haggle. On port days, you can find the shopping specialists in a number of recommended stores, helping their cruise guests with deal and providing raffles for jewelry and other gifts. 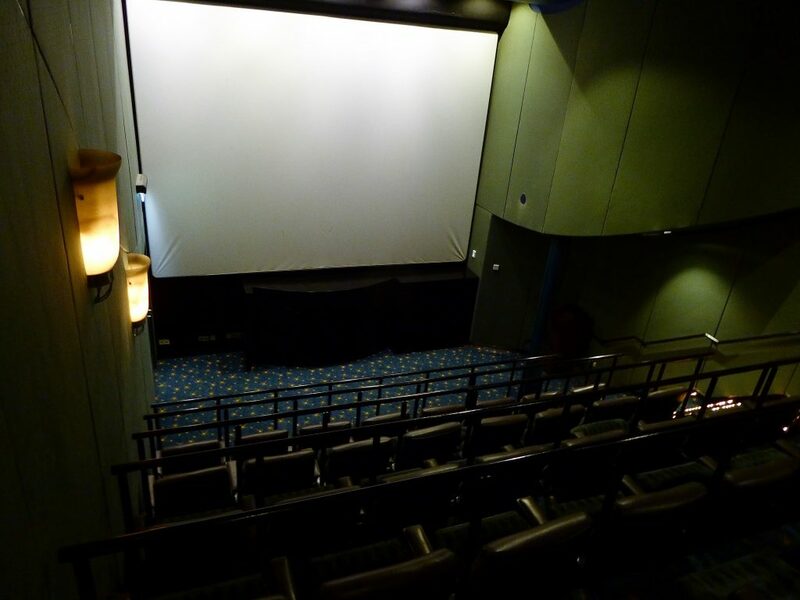 In addition to the giant screen near the pool, the Brilliance of the Sea also has a small cinema on Deck 6. The cinema shows both current and classic films. I am an old soul at heart, so I was thrilled to watch “Casablanca” during one of our stormy days at sea. Seating is limited at the cinema, so arrive early to get a seat. Casino Royale is located on deck 6. The casino has a number of table games and slot machines for those wishing to try their hand with Lady Luck. We appreciated that the casino was tucked away. 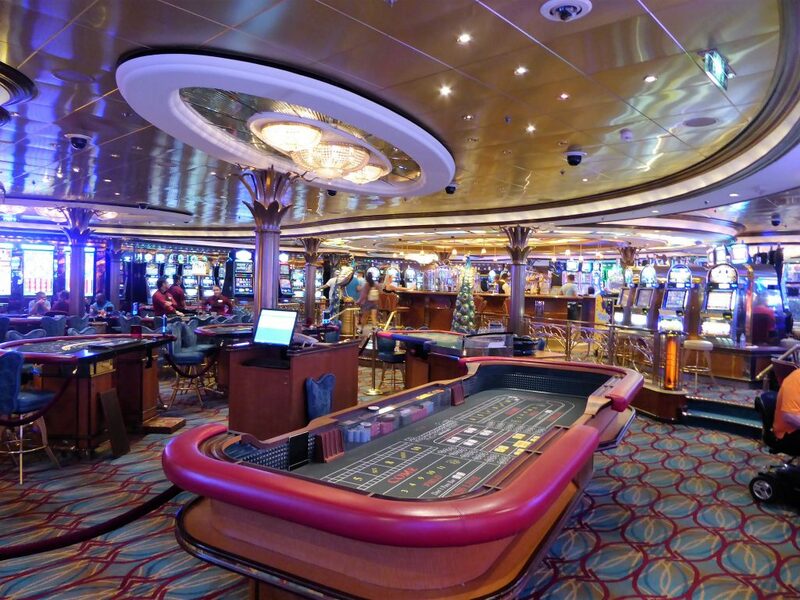 On other cruise lines, the casino is located on a main deck with lots of foot traffic. Since the casino is one of the places where guests can smoke, the smell of cigarette and cigar smoke always lingers in the casino. Many of my family members are sensitive to that smell, and we prefer to avoid the casino for this reason. On the Brilliance, our kids were able to avoid the casino. 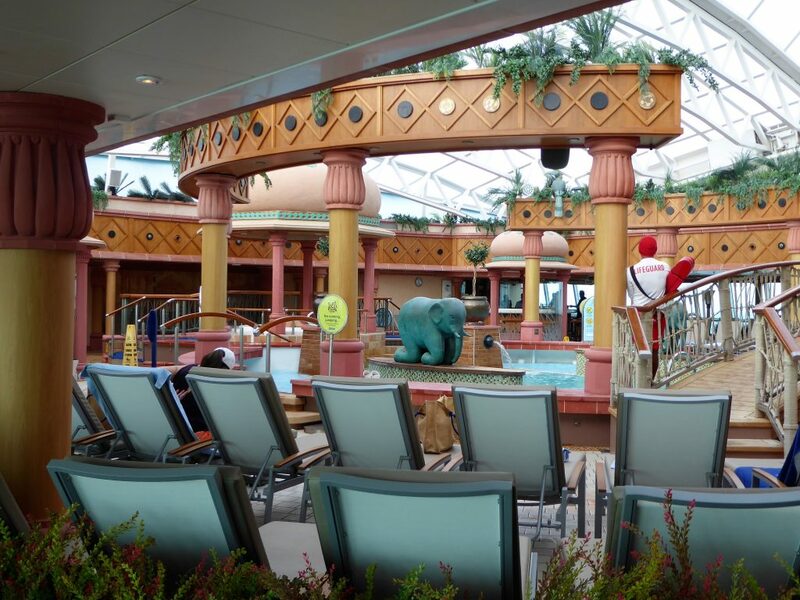 We love visiting the spa during a cruise. Honestly, we never visit the fitness center, but it is there for those of you who are interested in staying in shape while eating all day at the buffets. The Vitality at Sea Spa offers a number of services, including massages, manicures and pedicures, facials, haircuts, and more. The more procedures you schedule during your cruise, the more discounts you receive. Also, the spa offers special discounts during port days. The port day deals run all day, so you get a discount even later in the evening when the ship has left the port. Mom took advantage of the port day specials to get a mani and pedi. 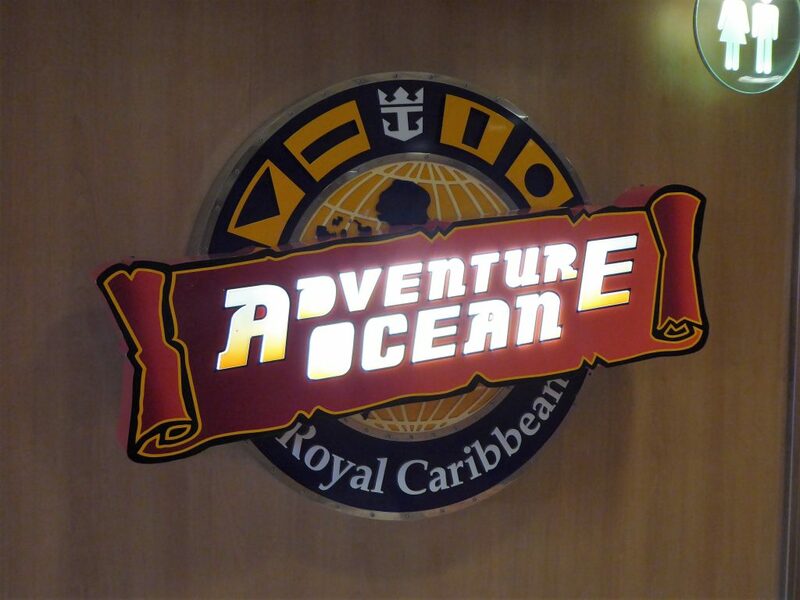 Royal Caribbean ships all have kids clubs for babies through teens. The clubs are age graded, and the staff provide an on-going series of age-appropriate activities. Royal Caribbean kids’ clubs emphasize art and science activities. During each session, the kids can enjoy a art of science project based on the session theme. Sessions last around three hours. Session times are 9-noon, 2-5 p.m., and 7-10 p.m. Special services are offered for after hours at an additional cost. The staff also picks your children up from dinner at the Minstrel Dining Room each evening. Adventure Ocean is designed for children ages 9-11. We found the lines to check in our kids at the beginning of the session long. One time, we waited in line for about 15 minutes to check in the kids. Insider Tip: Activities in the Toddler’s Area are more limited, and may include extra charges. 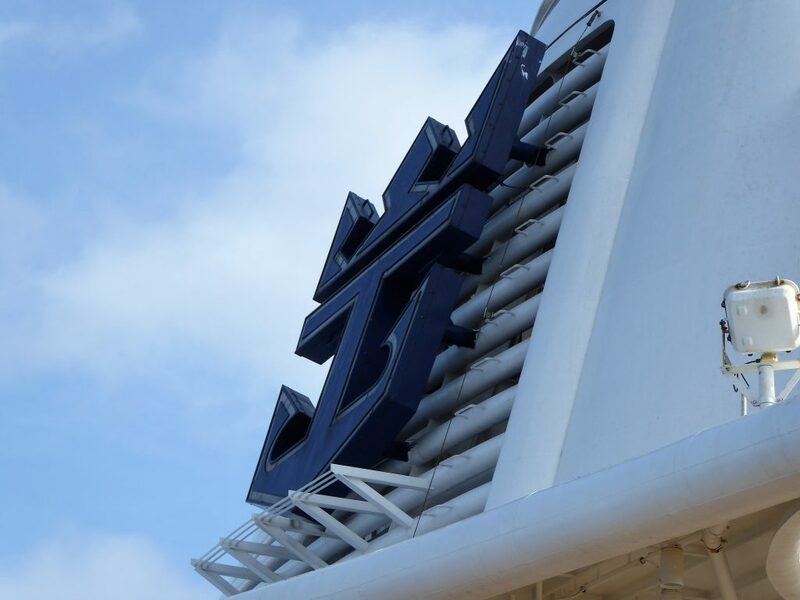 Check with Royal Caribbean before your cruise to know what is and is not offered during your sailing. The clubs provided some extra family activities after the 5 p.m. check out time. Our family was able to make “blow slime” and go on a ship-wide scavenger hunt during this time. 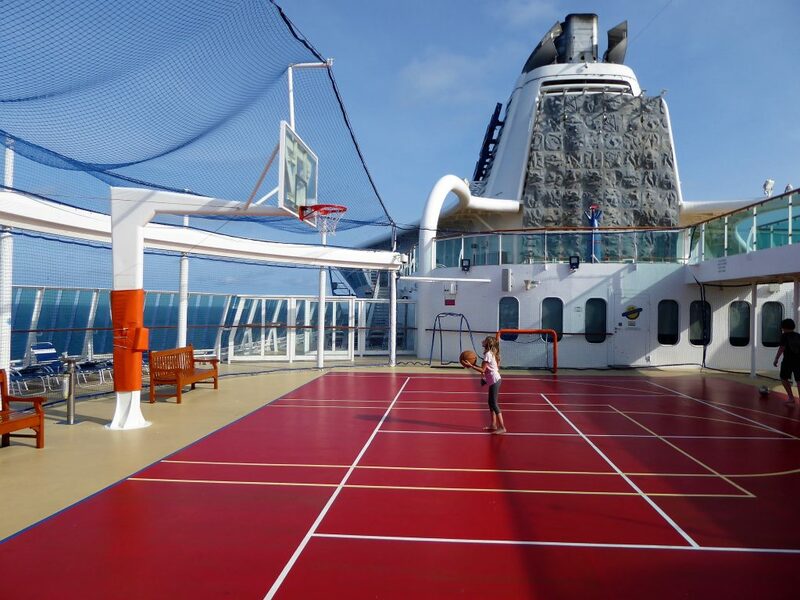 Our son lived on the sports deck, which included a court that could be used to play either basketball or soccer. 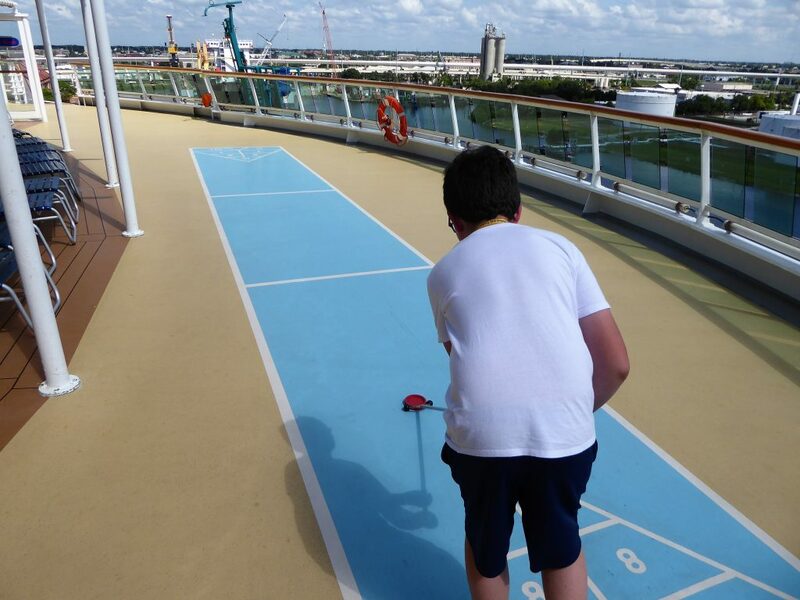 The sports deck also has a shuffleboard area and we enjoyed playing the game – even if we had to make up the rules. The sports deck also had checkers and chess boards painted onto the floor, although we did not see any pieces to play with. Finally, just off the Windjammer Cafe, the vessel has two ping pong tables. We got to play some, and didn’t lose any ping pong balls in the process. 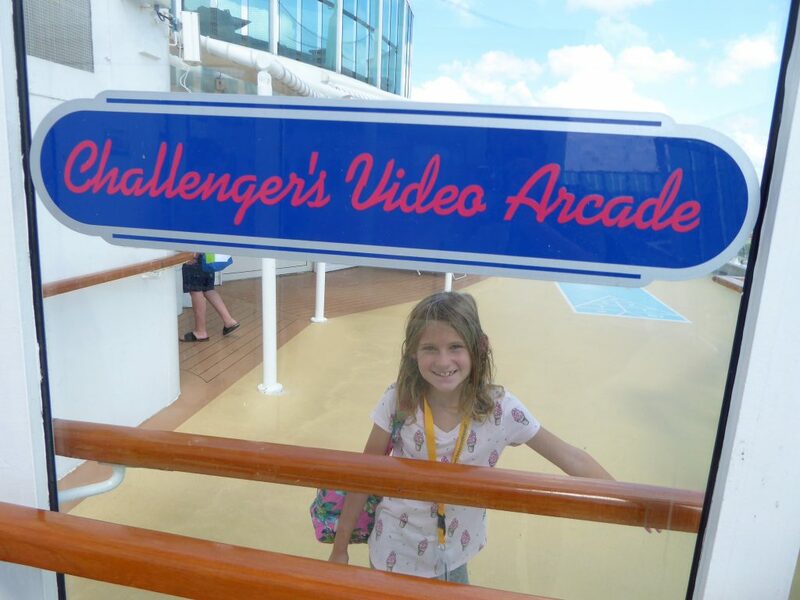 Our kids love spending time at any arcade, and the Challenger’s Video Arcade on board the Brilliance of the Seas was no exception. The arcade has video games, an air hockey table, and a few claw-machine style games. Our daughter was the envy of the arcade as she collected several prizes from the claw machines. 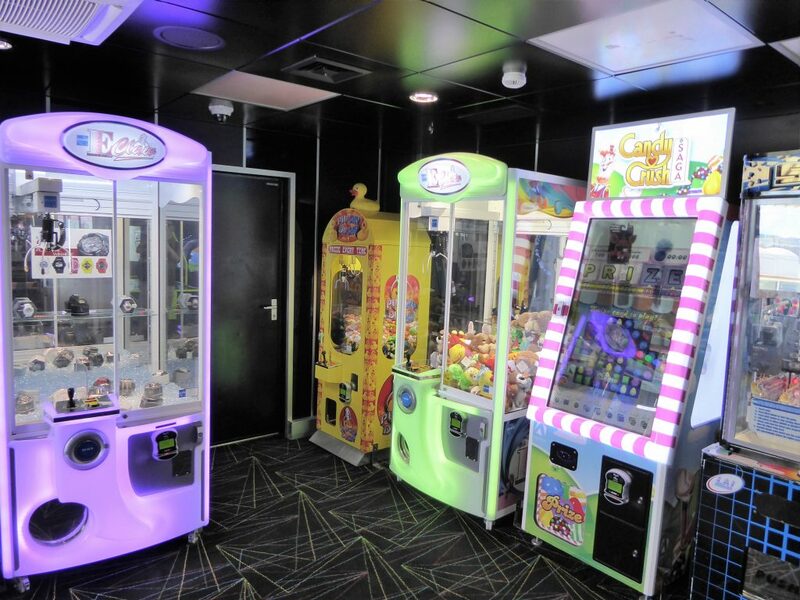 During our first night on board, the arcade provided one hour of free family play. On another day, there was a free play hour for teens, too. The machines were continually restocked so there were always ample prizes in the machines. 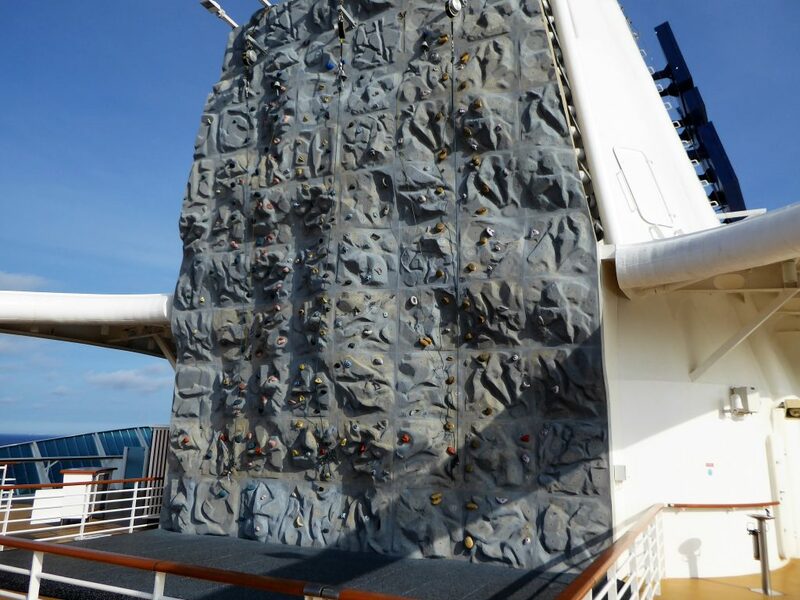 Royal Caribbean is well known for including unusual sports facilities on their ships — think ice rinks, surfing wall, and rock climbing walls. 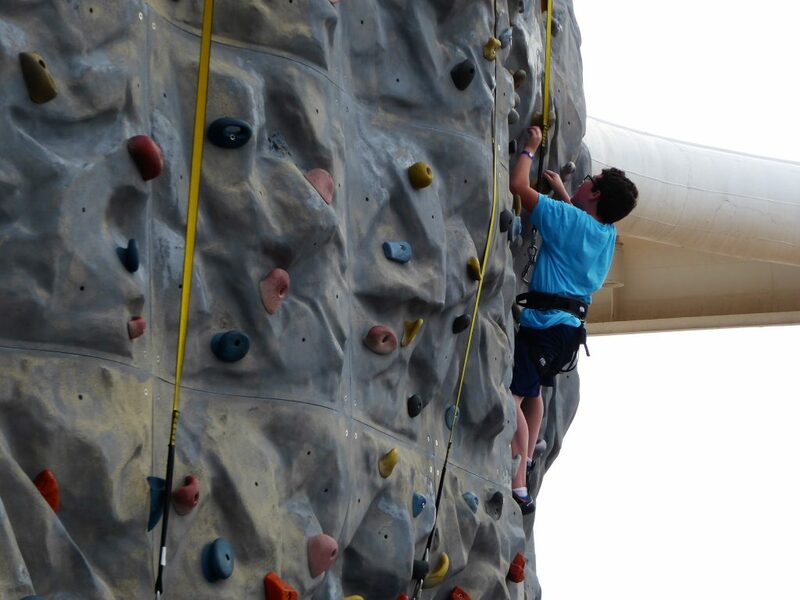 Brilliance of the Seas has a good sized climbing wall that my son and I tried out. You need to sign a waiver before climbing. We suited up with shoes and harness and then got free reign of the wall. There’s no need to worry about safety since the harness is attached to a bungi that guides you slowly to the ground if you fall off the wall. If you want to climb, get to the wall early since the lines can grow long. We went at the beginning of climbing hours and got right on. And our son conquered the rock wall twice. 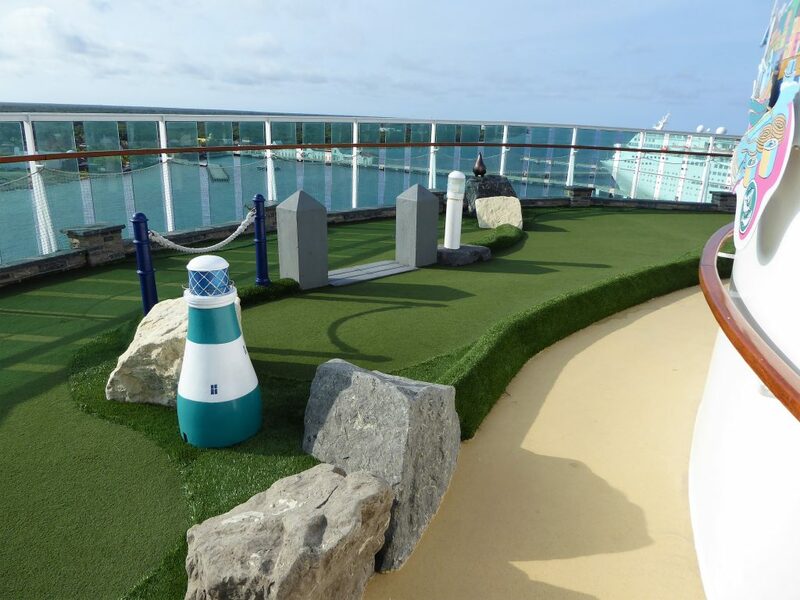 The mini-golf course is on the top deck of the Brilliance of the Seas. It is a fun, eight-hole course that our family played a couple of times during the cruise. Of course it can get warm up there, so be prepared. Also, during inclement weather, the top deck was closed and we were unable to use the golf course, rock wall, or pools. Near each elevator, you find an interactive deck screen. 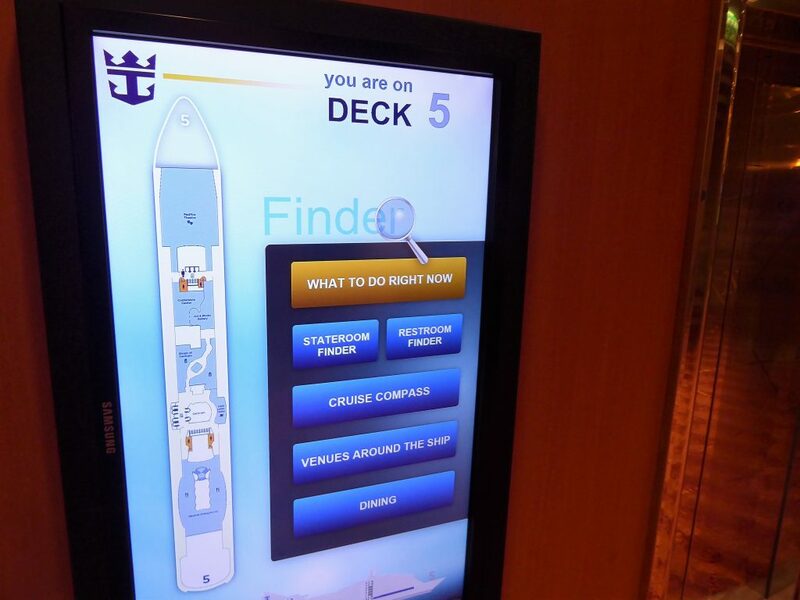 These interactive screens are helpful to find locations on each deck. The screens also can are valuable for downloading a activities on board. You can even check activities by category. Speaking of elevators, we enjoyed a fun touch on each elevator. Every day, a placard on the elevator floor announces the day of the week. Since we often get lost in vacation mode, this little reminder was appreciated. I took this picture in the elevator on Wednesday! 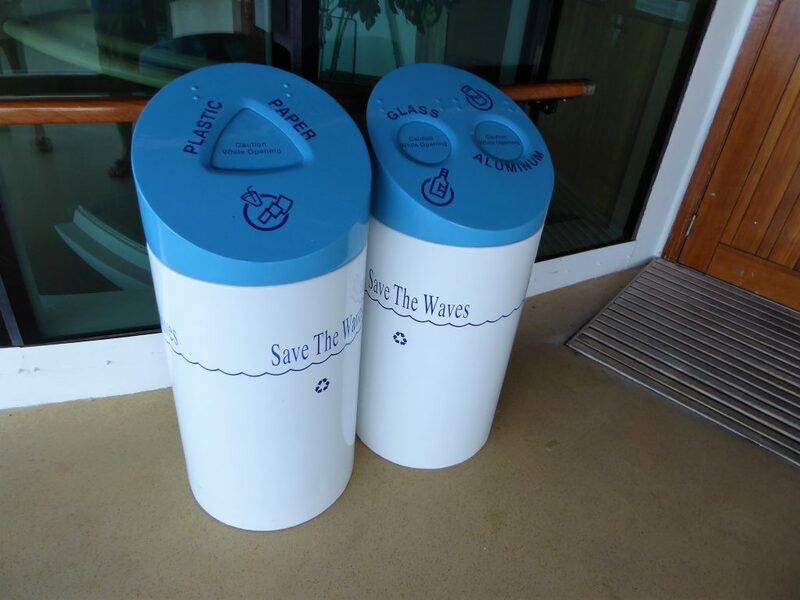 Royal Caribbean is committed to recycling and keeping trash out of the oceans and seas. We found recycling receptacles throughout the vessel. While the ship leaves a carbon footprint, Royal Caribbean and the Brilliance of the Seas are working to limit the size of that footprint. 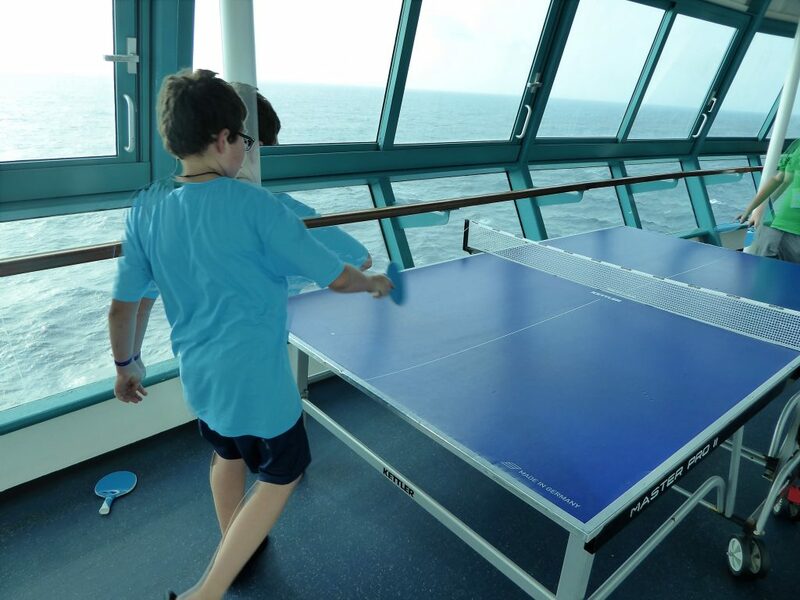 There are so many daily activities on board your ship. How can you keep track of all of the activities? With your Daily Compass, delivered nightly to your stateroom. The Compass lists all events and times, provides Cruise Director recommendations, lists operating hours of pools and desks, and explains the dining dress code each day. Of course, you are able to access the Compass using the interactive deck plans near the elevators. Our son looks out at the Caribbean Sea. We chose to do the self assist debarkation, and we were pleased with the speed and efficiency getting off ship. Unlike past trips, we did not have to fill out a customs form, although we still had to go through customs and present our passports and birth certificates. The self assist allowed us with bags in hand to walk off the ship without waiting for our numbers to be called, and proceed directly to customs. Since we were among the first to depart the vessel, there was no wait in customs and we were off the ship and out the door within 10 minutes. We would definitely recommend using this option. 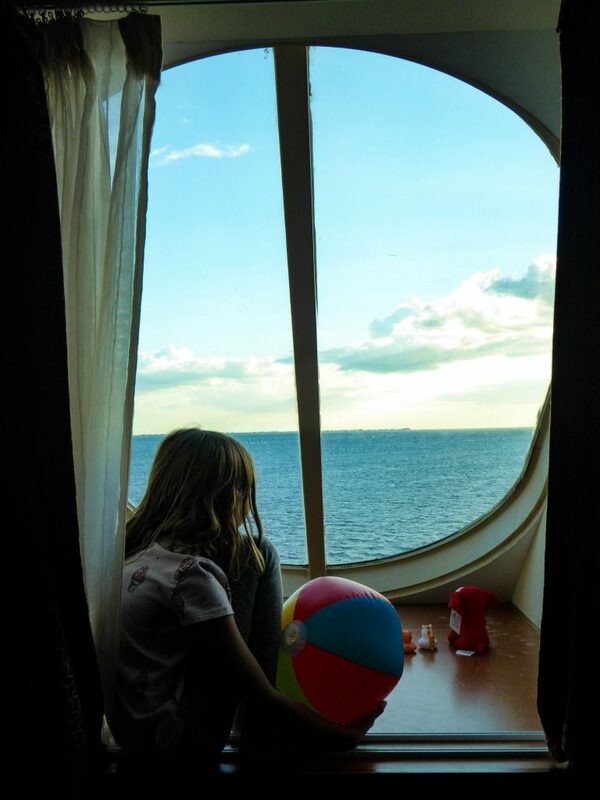 Read about how easy it is to cruise with kids – Yes, You Can Cruise with Kids. We attend a Park West VIP Art Auction with our Kids. If you’re flying to a cruise port, read our Tips for Flying with Children. Must admit I have never traveled on cruise ships, so I was intrigued to read the post. Sure it is not for everyone, but I understand it’s more fun than all-inclusive resort. Especially with kids. Never thought there are so many fun things to do, not even mentioning the visiting ports. Now I will consider to cruise one day too! Which was your favorite cruise you went on? Great question. We all have a favorite cruise. In terms of destinations, my wife’s favorite port is Cozumel. Our daughter liked Belize. Our son loved Roatan Island, Honduras. I enjoyed the Cayman Islands. Royal Caribbean is one of my favorite cruise lines, but I haven’t been on the smaller ones yet. I actually like the boarding process for cruises. I find it to be pretty smooth and we usually get our luggage fairly fast, but we board as soon as it opens too. That is a really large cabin for an ocean view room without being a suite. I’m impressed. Love the two windows and the kids little extra “side room”. Never seen one of those before! I always avoid the pools on ships like the plague. Way too crowded for me too! Don’t think I’ve ever seen a second cinema (besides the big one above the pool) before-so cool. And I love the day of the week announcements, haven’t seen that before either. 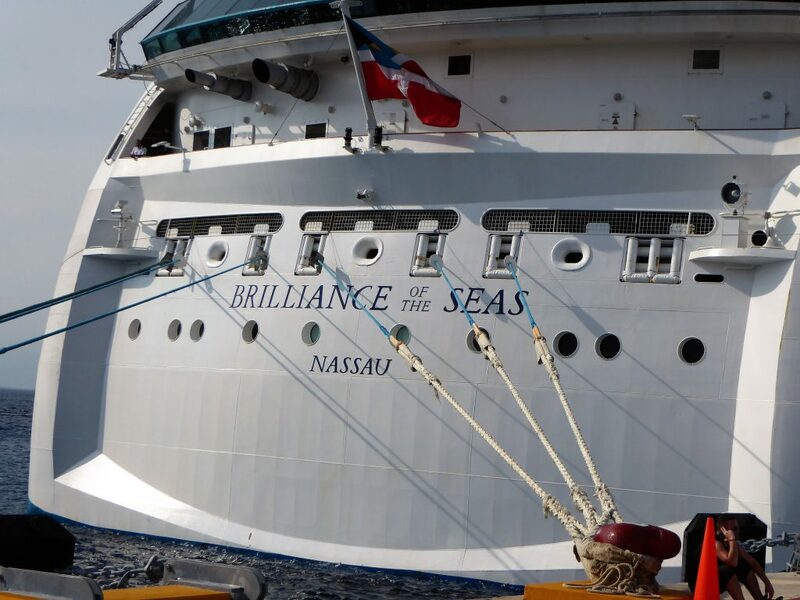 All-in-all, Brilliance looks like a great smaller cruise ship! I think the boarding process, in general, has improved for all cruises over the years. Here’s to your next cruise! The pool area and rock climbing always look like so much fun on these huge cruises. My sister loves cruises and has been on several, but I have yet to get onboard. Hopefully, sometime soon I’ll get a chance as it looks like so much fun! There really is a ton of entertainment and activities for everyone. There is so much to do. Hope you get to join your sister on one soon. I’ve never been a cruise ship before as I get seasick. But seems like it is really fun. 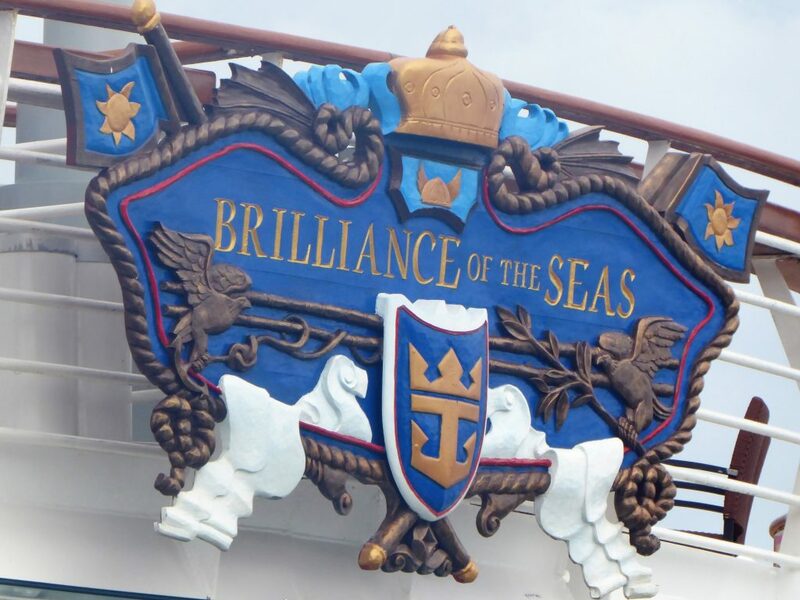 The Royal Caribbeans Brilliance of the Seas has a very apt name as it’s brilliant. Your room looked quite spacious except for the bathroom. There is so much to see and do. My favorite would be to grab a book and coffee. 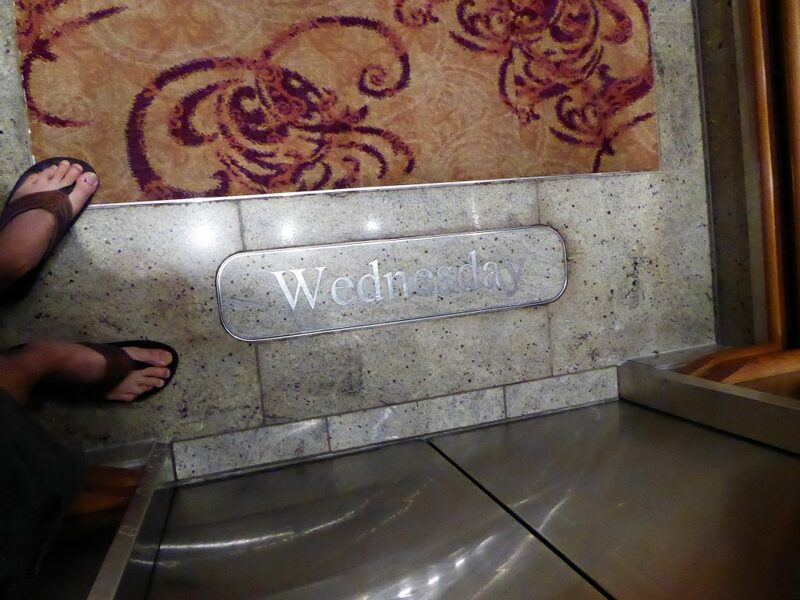 Also interesting that they have the day of the week placard in the elevator. Hope I get to do a cruise someday! We loved our room. I, too, like to sit down with a good cup of coffee and an even better book. We live about an hour away from Port Everglades and Tampa. We have often considered taking a cruise since it is so close by. It’s amazing how many little features ships like these have, even for a smaller cruise ship. Oh my goodness, we were in your neck of the woods. We left from Tampa. You definitely should look into the last minute cruise deals. I’m sure you could get a great deal booking a few days before the cruise. If we lived closer to a port, we would take advantage of those deals. thanks for this in depth look at the cruise ship. They definitely have some interesting activities for the whole family. Something I’ll keep in mind the next time I book a cruise. Thanks again. There are plenty of activities for people of all ages. I have been on a cruise on the AIDA and found the offer on board already very large. Apparently there was more on your journey. Should you ever come to Germany, drive to Papenburg in the Meyer shipyard. It is totally exciting how the cruise ships are built. We would love to see a cruise ship under construction. It would be fascinating to behold. I’ve never been on a cruise and this looks fun! 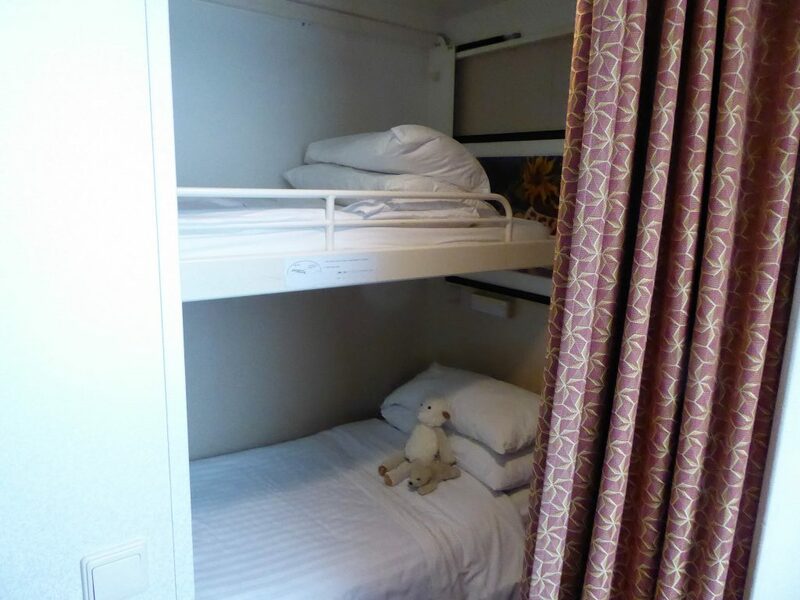 The rooms on board look spacious and there seems to be a lot of options for entertainment. You need to try a cruise. It’s our favorite vacation style. There are too many options, we always find that we have to pick and choose. Haha, we needed to visit the gym in order to take pictures, and unfortunately, that just didn’t happen. Well, we did visit the gym to see if we were winners in the spa raffle on the first day of the cruise, but that was the only time! I have only cruised once before to Alaska, and it was OK. I honestly probably wouldn’t do it again, BUT if I had kids, I would totally consider it. Seems like an amazing option for a family. There is so much to do and keep everyone entertained. I’d probably really enjoy just being able to read and go to a movie actually. And I’d probably enjoy a tropical destination even more. This is an extremely thorough review, and love that you shared the good and the bad. We want to try an Alaskan cruise, although we do enjoy our tropical ports. Cruise ships sure offer plenty of activities with a little something for everyone. I’d be up for seeing the comedian and taking in a spa day!